In summer 1982, I contracted to deliver an Olson 30 from Honolulu to San Francisco—my first skippered delivery. 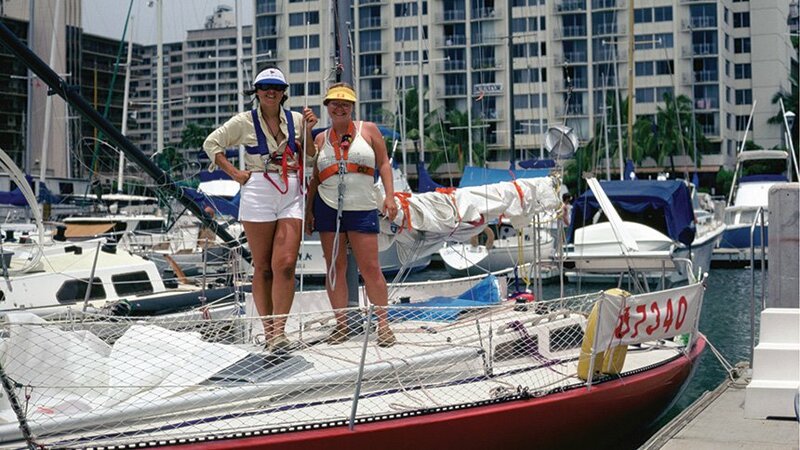 A woman who had entered a solo race to Hawaii but never qualified or raced begged me to take her as a crewmate. Without asking questions, I paid her airfare to Hawaii. Big mistake. I’d explained all the hardships aboard a 30-foot ultralight displacement boat. A true ’70s Santa Cruz race boat, Gold Rush traded comfort for sailing performance. It had low freeboard, no head, no plumbing and no engine. It had no standing headroom and no comfortable place to sit below. It had only two pipe berth bunks and a butane cooking pot strapped to the mast. Each wave slap echoed inside the uninsulated hull, making earplugs mandatory. The boat had a compass, a wind vane, compass-driven tiller self-steering, a VHF radio, a knotmeter and log, and solar panels to power the autopilot and running lights. I had shipped over my small Honda generator to supplement the solar panels. We used celestial navigation, as Loran-C and Sat Nav were not widely used at the time and only the military used GPS. We packed supplies aboard, including a blue bucket for washing dishes and ourselves and a brown one because there was no head. We left Honolulu’s Ala Wai Harbor, heading west. After drifting in the wind shadow on Oahu’s west side and clearing the far point overnight, we headed north into the open sea and easterly trade winds, going from 10 knots to close-hauled in 25 knots. Heeling at about 25 to 30 degrees, we took water over the bow and into the cockpit. While I steered and set up the wind vane to self-steer, my crewmate went below, got sick, grabbed the bucket and headed to her bunk. Unfortunately, she chose the leeward bunk, and her weight made a huge difference in the boat’s heel. I tried unsuccessfully to get her to move to the other bunk to help distribute the weight. But by then she was heaving into the bucket and screaming that she was going to die. Since I couldn’t reason with her, I kept sailing. By morning, the Hawaiian Islands were in the distance, but her screams hadn’t stopped. To save my sanity and hers, I told her she could either stop yelling, tough it out and participate, or we would go back and she would get off the boat. She chose to turn around, so 24 hours later, after a rougher sail going back than we had going north, we sailed into Ala Wai Harbor. I had called my husband in Honolulu on the VHF and asked him to find my friend Karin. When we pulled in, my erstwhile crewmate kissed the dock and told me I had saved her life. Buying her ticket back to San Francisco was a small price to pay to get Karin onboard and get the job done. The experience taught me to be careful choosing crew for long voyages. People behave differently out of sight of land, and the surest way to discover their foibles is to do some shakedown sailing. The great thing about Karin is her sense of humor. We laughed at wearing kneepads to crawl on deck and inside the boat because standing up wasn’t safe. We wore shower caps on deck. We laughed at a solitary cockroach crawling around the cabin ever slower as it got colder heading north. We even staged the cockroach’s Viking funeral in the cockpit. We nicknamed our boat “Maytag One” because of the sloshing and extreme twisting belowdecks. Off San Francisco, we sailed through a dry gale, surfing down 15-foot waves in 30-knot winds with drogues to keep our rudder in the water as we blasted along under storm jib and triple-reefed mainsail. Karin said it was quiet below. I explained it was because the boat from the keel forward was out of the water surfing down the waves. She tried to laugh as she climbed in the cockpit to take the helm but avoided looking at the wave tops, which looked higher than our spreaders. We sailed into San Francisco Bay after 21 days. Karin was a real trouper, and we’ve been best friends for over 30 years. Linda Newland of Point Wilson Sail & Power Squadron/16 lives in Port Hadlock, Washington, and serves as assistant squadron educational officer. 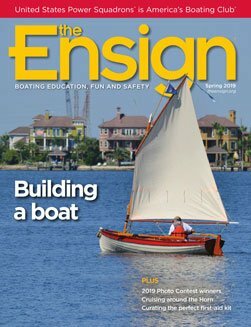 An accomplished blue-water sailor, Linda teaches sailing and serves as president of the National Women’s Sailing Association, a program of the Women’s Sailing Foundation. She also serves as vice president for administration for the Recreational Boating Association of Washington, which represents boaters in statewide boating legislation and regulatory issues.